At this page, you can see details about the lenders represented on Robocash and the model of operation with investors and find loan agreements for better understanding to which conditions borrowers are served in different countries by different lenders. LLP Zaimer began its work in the Republic of Kazakhstan in August 2015 with the launch of the first country's robotic service providing instant loans to a bank card completely online. Today, the service attracts customers also through its own offline network, which has 125 sales branches. Based on the results of the analysis of the company's financial performance in 2016, the service The Strongest in Kazakhstan awarded LLP Zaimer with a status the "Strongest" in the field of online lending. LLP Zaimer acts as a member of the FinTech Association of the Republic of Kazakhstan and takes a direct part in the formation and development of the local market of alternative lending. Verified Users of the platform ROBOCASH (limited liability company Robocash d.o.o.) can access loans of the service Zaimer.kz issued and uploaded to the platform by LLP Zaimer, which are linked by the ultimate beneficiary Sergey Sedov. Each loan is assigned to the relevant final Borrower and is secured by the rights of the LLP Zaimer to the Borrower under the Consumer loan agreement. According to the Assignment Agreement, ROBOCASH is authorized to service the claims, accept payments arising from the Consumer loan agreement, which LLP Zaimer receives from the Borrower and transfers to the account on the platform ROBOCASH, and pay them to the User in the order and amount stipulated in the Assignment Agreement. 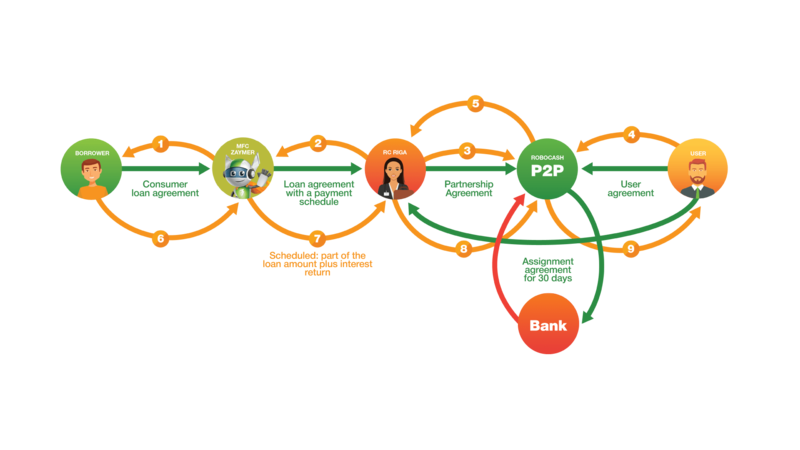 The principal amount of the consumer loan received by LLP Zaimer from the Borrower and transferred to the account on the platform ROBOCASH is simultaneously paid to the User in proportion to the amount of the acquired right of claim against the specific Borrower in full together with the accrued interest. When repayment of the consumer loan is extended or delayed for more than 30 calendar days, LLP Zaimer buys out the right of claim of the User of ROBOCASH in full with the simultaneous payment of the accrued interest. LLC PRESTAMER has been active in Spain since September 2016. The company is specialized in short-term lending through a fully automated online service PRÉSTAMER. The main product is PDL loans with a size of up to 1 000 EUR and a maturity period of up to 30 days. LLC PRESTAMER follows the policy of responsible lending and contributes to the development of the industry as a member of the National Association of Financial Institutions (ASNEF) of Spain. Verified Users of the platform ROBOCASH (limited liability company Robocash d.o.o.) can access loans issued and uploaded to the platform by LLC PRESTAMER, which are linked by the ultimate beneficiary Sergey Sedov. Each loan is assigned to the relevant final Borrower and is secured by the rights of the LLC PRESTAMER to the Borrower under the Consumer loan agreement. According to the Assignment Agreement, ROBOCASH is authorized to service the claims, accept payments arising from the Consumer loan agreement, which LLC PRESTAMER receives from the Borrower and transfers to the account on the platform ROBOCASH, and pay them to the User in the order and amount stipulated in the Assignment Agreement. The principal amount of the consumer loan received by LLC PRESTAMER from the Borrower and transferred to the account on the platform ROBOCASH is simultaneously paid to the User in proportion to the amount of the acquired right of claim against the specific Borrower in full together with the accrued interest. When repayment of the consumer loan is extended or delayed for more than 30 calendar days, LLC PRESTAMER buys out the right of claim of the User of ROBOCASH in full with the simultaneous payment of the accrued interest. LLP Zaimer began its work in the Republic of Kazakhstan in August 2015 with the launch of the first country's robotic service for issuing instant loans to a bank card completely online. Today, the service attracts customers also through its own offline network, which has 125 sales branches. Based on the results of the analysis of the company's financial performance in 2016, the service The Strongest in Kazakhstan awarded LLP Zaimer with a status the "Strongest" in the field of online lending. LLP Zaimer acts as a member of the FinTech Association of the Republic of Kazakhstan and takes a direct part in the formation and development of the local market of alternative lending. Verified Users of the platform ROBOCASH (limited liability company Robocash d.o.o.) can access TezCredit loans that have been uploaded to the platform by LLP Zaimer, which are linked by the ultimate beneficiary Sergey Sedov. TezCredit is the first creditor on the platform ROBOCASH, providing Installments loans. Each TezCredit loan is assigned to the relevant final Borrower and is secured by the rights of the LLP Zaimer to the Borrower under the Consumer loan agreement. According to the Assignment Agreement, ROBOCASH is authorized to service the claims, accept payments arising from the Loan Agreement, which LLP Zaimer receives from the Borrower and transfers on the account on ROBOCASH, and pay them to the User in the order and amount stipulated in the Assignment Agreement. The principal amount of the consumer loan received by LLP Zaimer from the Borrower and transferred to the account on the platform ROBOCASH is simultaneously paid to the User in proportion to the amount of the acquired right of claim against the specific Borrower in full together with the accrued interest. If the User does not want to wait until the loan expiry, the User has the right to return investments on the page "My investments" in the personal account. In case of cancellation of the investment before an expiry of the claim, the User receives return according to the actual period of possessing the right for the loan. LLP Z-FINANCE started its work in the Republic of Kazakhstan in July 2018. The company provides lending in cash through an offline network comprising 102 branches. The main product is PDL loans equivalent to 470 euro with maturity up to 30 days. It is planned to launch an online service in 2018. Verified Users of the platform ROBOCASH (limited liability company Robocash d.o.o.) can access loans issued and uploaded to the platform by LLP Z-FINANCE, which are linked by the ultimate beneficiary Sergey Sedov. Each loan is assigned to the relevant final Borrower and is secured by the rights of the LLP Z-FINANCE to the Borrower under the Consumer loan agreement. According to the Assignment Agreement, ROBOCASH is authorized to service the claims, accept payments arising from the Consumer loan agreement, which LLP Z-FINANCE receives from the Borrower and transfers to the account on the platform ROBOCASH, and pay them to the User in the order and amount stipulated in the Assignment Agreement. The principal amount of the consumer loan received by LLP Z-FINANCE from the Borrower and transferred to the account on the platform ROBOCASH is simultaneously paid to the User in proportion to the amount of the acquired right of claim against the specific Borrower in full together with the accrued interest. When repayment of the consumer loan is delayed for more than 30 calendar days, LLP Z-FINANCE buys out the right of claim of the User of ROBOCASH in full with the simultaneous payment of the accrued interest. Limited Liability Company RC Riga is special purpose vehicle incorporated in Latvia in 2018 sole purpose of which is to provide secured financing to LLC MFC Zaymer against loan portfolio thereof. LLC MFC Zaymer (hereinafter MFC Zaymer) started its work in Russia in 2013 having launched a high-tech online lending service “Robot Zaymer”. The company is registered in the Unified Register of Legal Entities of the Russian Federation. According to the company’s financial results in 2016, MFC Zaymer was awarded the reliability rating of A.mfi by the independent agency RAEX in Russia. In March 2017, the Central Bank of the Russian Federation assigned the company the status of a microfinance company (MFC). The main product is short-term consumer loans of up to 30,000 rubles with a maturity period of up to 30 days. MFC Zaymer issues about 7 million euros a month and the total number of borrowers is more than 550,000. 1. MFC Zaymer transfers funds to Borrowers under the Consumer loan agreements, the right of claim to them will be a guarantee for the performance of obligations under the Loan agreement signed between MFC Zaymer and the Limited liability company RC RIGA (hereinafter RC RIGA). 2. RC RIGA transfers funds to MFC Zaymer under the Loan agreement specifying a payment schedule. Dates in the payment schedule correspond to the dates of repayment under the Consumer loan agreements, the right of claims to which serve as a the guarantee for the performance of obligations under the Loan agreement. 3. RC RIGA transfers to the limited liability company Robocash d.o.o. (hereinafter ROBOCASH) the information about the loan issued to MFC Zaymer according to the Partnership Agreement. 4. According to the signed Assignment Agreements, Users of the platform transfer funds to RC RIGA through ROBOCASH to acquire a part of a claim for the Loan agreement concluded between RC RIGA and MFC Zaymer. 5. ROBOCASH transfers funds received from Users to RC RIGA. 6. Borrowers return funds to MFC Zaymer under the Consumer loan agreement. 7. MFC Zaymer returns funds RC RIGA according to the payment plan under the Loan agreement. 8. RC RIGA returns funds and interests received from MFC Zaymer to ROBOCASH on the date and in the proportion specified in the Assignment Agreements. 9. ROBOCASH transfers funds received from RC RIGA to Users of the platform. 10. In case of an extension or a delay of the loan repayment made by a Borrower, the next day MFC Zaymer completely returns the size of the consumer loan and the accrued interests to RC RIGA. ROBOCASH FINANCE CORP. started its operation in the Philippines in October 2017. The company is working in the alternative lending market providing short-term loans to the population through an automated online service Robocash.ph. The main product is loans of up to 25,000 PHP and with a maturity period from 7 to 30 days. Verified Users of the platform ROBOCASH (limited liability company Robocash d.o.o.) can access loans issued and uploaded to the platform by ROBOCASH FINANCE CORP., which are linked by the ultimate beneficiary Sergey Sedov. Each loan is assigned to the relevant final Borrower and is secured by the rights of ROBOCASH FINANCE CORP. to the Borrower under the Consumer loan agreement. According to the Assignment Agreement, ROBOCASH is authorized to service the claims, accept payments arising from the Consumer loan agreement, which ROBOCASH FINANCE CORP. receives from the Borrower and transfers to the account on the platform ROBOCASH, and pay them to the User in the order and amount stipulated in the Assignment Agreement. The principal amount of the consumer loan received by ROBOCASH FINANCE CORP. from the Borrower and transferred to the account on the platform ROBOCASH is simultaneously paid to the User in proportion to the amount of the acquired right of claim against the specific Borrower in full together with the accrued interest. When repayment of the consumer loan is extended or delayed for more than 30 calendar days, ROBOCASH FINANCE CORP. buys out the right of claim of the User of ROBOCASH in full with the simultaneous payment of the accrued interest.